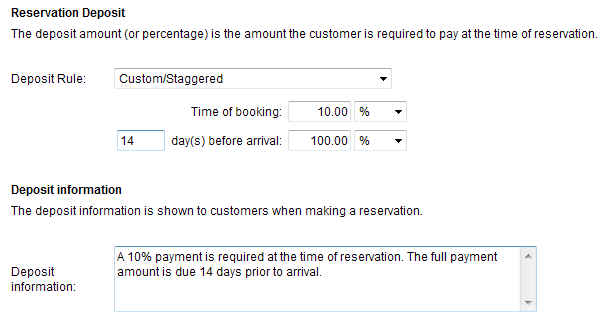 The WebReserv booking system now supports staggered payments. This allows you to require a deposit at the time of reservation and an additional amount prior to arrival. In order to use this feature, you need to be set up for automatic payment processing using one of the recommend merchant account providers. To configure your product(s) for staggered payments, go to Setup – Products & Reservation Rules – Product – Tax/Deposit. Select Custom/Staggered as the deposit type and enter the payment amounts or percentages. Once you have activated staggered payments, the system will automatically charge the customer card the specified number of days in advance if the reservation is confirmed. The system will not charge automatically if the reservation is pending or cancelled. This entry was posted in Payment Systems and tagged booking system staggered deposit, receive staggered deposits, Receive staggered payments, staggered deposit, staggered payments, Webreserv recive staggered payments. 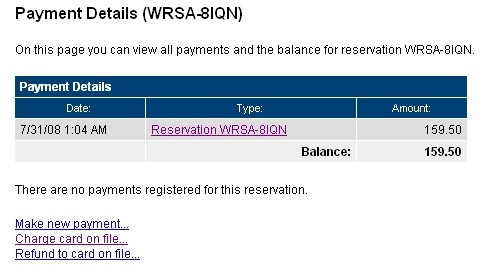 The WebReserv booking system now receives IPN (Payment Notifications) from PayPal. This makes it easier to keep track of reservations that have been paid and reservations that have not been paid. When a PayPal reservation is made, it will be marked with the status Awaiting Payment. This status indicates that the system has not yet received a payment notification from PayPal. As soon as the payment notification is received, the status will automatically changed to Pending or Confirmed, depending on the setup. It can happen that a customer does not complete the payment process with PayPal. The WebReserv booking system will automatically cancel the reservation after the expiration time. The default expiration time is 15 minutes after the reservation as made. 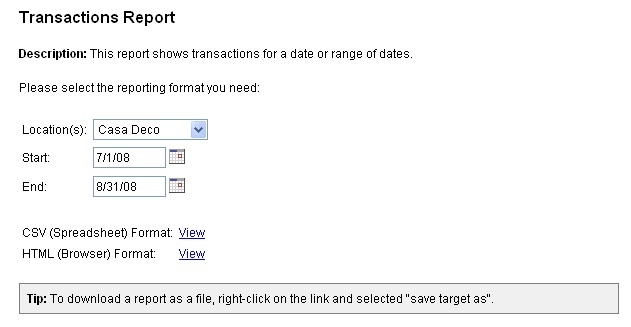 You can adjust the expiration time or turn off the automatic expiration under Setup – Business Information – Payments. Note that PayPal may send a Pending payment notification. A pending payment notification indicates that the payment is pending, but not yet completed. The WebReserv booking system will treat a pending payment notification as if a payment was received, i.e. the reservation status will change to Pending or Confirmed. This entry was posted in Payment Systems and tagged booking system paypal payments, charge deposit with paypal, paypal how it works, webreserv paypal, what you need to know about WebReserv. We are pleased to announce that you now can use First Data Global Gateway for payment processing. This entry was posted in Payment Systems and tagged booking system Chase Paymentech Orbital, booking system First Data Global, booking system Quickbooks Merchant Services, booking sytem Authorize.net, First Data Global, First Data Global Gateway interface, First Data Global webreserv, payment provider First Data Global. We are pleased to announce the release of the Quickbooks Merchant Services (QBMS) payment gateway. The QBMS payment gateway makes it possible to use Quickbooks Merchant Services directly with WebReserv.com. This is great news for businesses that already use Quickbooks for accounting as it is now possible to use a single merchant account for both WebReserv reservations and credit card charges made through Quickbooks. The QBMS payment gateway can be used by all businesses that have a WebReserv Gold or WebReserv Enterprise account. If you do not have a merchant account with Quickbooks already, we have a great offer for you: Sign up for Quickbooks Merchant Services and get it for free. That’s right – no setup fee, no application fee and no service fees for the first two months. Take advantage of this great offer, by calling Quickbooks Merchant Services at 1-800-601-3751 and mention Web Reservation Systems, Inc. to take advantage of this offer. As always, you can automate credit card processing through WebReserv with all merchant accounts that are compatible with Chase Paymentech. This entry was posted in New Features, Payment Systems and tagged integrastion Quickbooks Merchant Services, payment gateway Quickbooks Merchant Services, webreserv Quickbooks Merchant Services. In order to process credit card payments, you must set up a merchant account for your business. The merchant account functions as a connection between the credit card companies and your bank account. Many banks provide this service, but specialized merchant account providers (also called ISO’s) may offer better terms and are typically more familiar with online payments and credit card terminals. The transaction percentage, often called the discount rate, depends on the merchant account provider, your industry and your sales volume among other factors. It is common to have transaction fees around 2.5% – 3.5% of the total sale. In order to accept PayPal transactions, you have to create a PayPal account. It’s free and can be done in just a few minutes. With PayPal you can accept payments from other PayPal users. You can also upgrade to a business account and accept credit card payments from non-PayPal users. In this case, PayPal essentially becomes the merchant account for you. There are some drawbacks of PayPal compared to credit card payments. Most importantly, PayPal payments go to a PayPal account and you will have to transfer the funds to your own bank account. While the funds are transferred around the PayPal system, and until the funds are transferred to your bank account, PayPal earns the interest, you don’t. With PayPal you don’t have a credit card on file. This is an issue in cases where the business needs to charge outstanding deposits to the same card. With a credit card/merchant account, you can charge the balance due, but with PayPal you’ll have to ask the customer to initiate the funds transfer. This entry was posted in Payment Systems and tagged booking system credit card, booking system credit card payment, booking system payment gateway, booking system paypal, receive deposits, webreserv cash payment, webreserv cheque payment, webreserv credit card payment, webreserv paypal payment, webreserv receive deposit. You can now view, download and print a report containing all transactions registered in WebReserv. The report includes all automated credit card transactions, credit card transactions performed using the Virtual Terminal and Cash/Check transactions entered for each reservation. To view or print the report, to do Frontdesk – Reports – Transaction Report. Tip: All WebReserv reports can be downloaded as CSV and imported into most spreadsheets and databases. This entry was posted in New Features, Payment Systems, Reporting and tagged credit card processing, transactions. With WebReserv.com, you can now process additional charges when your customer’s creditcard information is on file. To process additional charges to the creditcard on file, click view/update payment information from the reservation screen and select Charge creditcard on file. From the same menu, you can easily process refunds to the same creditcard. For security reasons, you should never refund to other cards than the creditcard that was used to make the original payment. The reason for this is that some hackers may try to make a reservation with one (usually stolen) creditcard and request a refund to a different card, thereby pocketing the money while leaving you to cover the charge back. This entry was posted in New Features, Payment Systems and tagged additional credit card payments, charge credit card on file, credit card on file, webreserv credit card process.